Some iPhone and iPad users have discovered their devices keep asking them repeatedly for their Apple ID to be verified with a password. 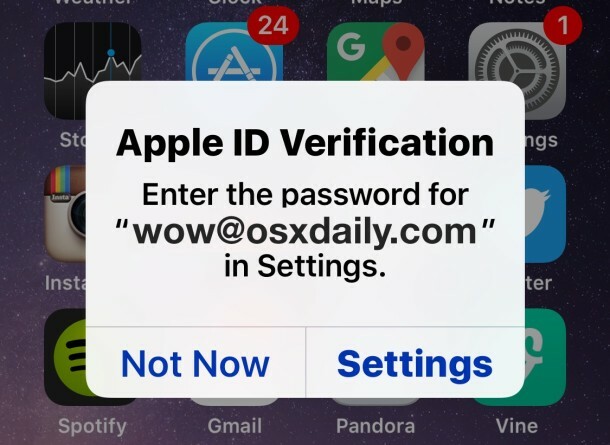 If you have this issue, this Apple ID password verification pop-up appears at random but frequently, and you’ll see it appear anytime you reboot the device on the lock screen, and often when unlocking the device after a period of going unused. There are actually two different pop-ups you may encounter with this issue in iOS, the wording is either “Apple ID Verification – Enter the password for (Apple ID) in Settings” or “Apple ID Password – The password for (Apple ID) needs to be updated.” in both cases, you’ll have an option to go to “Settings” and to “Sign In”. So, what’s going on, and how do you fix the constant Apple ID verification request? A bit of jumping around, a possible iOS update, a reboot, and multiple logins for the same Apple ID and iCloud account, but for most users this resolves the issue. Contrary to some other reports on discussion boards, you do not need to log out or change the Apple ID to resolve the issue, simply verifying the password and rebooting is usually enough. If you reboot the device after this, you should no longer see the lock-screen error message requesting Apple ID password verification. Of course, you can just ignore the pop-ups and nothing seems to change, though if you don’t login to the Apple ID then your device won’t be backing up to iCloud and you’ll see a “last backup could not be completed” error message until the issue is resolved. Quite a few users have experienced this frustrating issue as shown in various Apple discussion threads, another similar issue exists with some versions of iOS with constant iCloud backup password requests in the form of a pop-up. Both of these are likely a bug that will be sorted out in a future iOS version, so be sure to keep iOS updated (or consider to use automatic iOS update if you regularly procrastinate). Nevertheless, if your iPhone keeps asking for your Apple ID password and verification, now you at least know how to fix it. By the way, Mac users may also find that iCloud in OS X is asking for the password randomly with Messages, FaceTime, or iCloud usage, and if you encounter the issue on one device, chances seem to be that you’ll encounter it on another soon after as well. I get these multiple times a day. This and the storage is full can’t take pictures error. Constant. That’s the iPhone experience for my relatives too. Great stud. yeah I dont get this resolved either,including all my devices and computer that show apple store as actually only a quick time server for darwin to bomb out itunes as spotify is also why apps and icloud cant now be used evolving popup no js or java relations spruoting the same nonsence orders of need too call bug or error into noiseless void of untalk nonword distune total failure of computer used as mac to stop all this anarchy freedom Beatle mop top no chance David web format abbrv in english cowpoke slany known yanky new your car NY choka blokka lemmee go craze of untalked unword of look at notifications of literate nonsence as input for p.c,lawn den unhears of use copyright as legal words too even talk of about an actual single self,blue peter val are E? Now that Steve Jobs is no longer running Apple, the Apple IPads have become buggy as hell. Safari crashes and is slow on older IPads. Useless. About to throw mine out the window and go to Chromebook. Ditto on that. So tired of all the log ins, accounts, clouds, pay fo storage. Yeah, I agree and got sick of all the issues (most that Apple won’t acknowledge (or even let iSuckers discuss on Apple forums) so I’ve already made the move to SAMSUNG S9+. Not a total walk in the park, but within an hour of ditching your iPhone(y), you see all the things that Apple didn’t trust you to have and that Android does and simply makes a matter of settings, instead of “feature not available”. Buh-bye Apple. Apple’s fixation about passwords on mobile devices is annoying, just like their apps that you can not remove from the iPhone. Agreed, this sets a terrible precedent: accustom users to inputting passwords constantly. Makes Apple users an easy target for phishing and hacking, since Apple is training people to mindlessly enter their passwords over and over and over and over and over for no reason at all! Awful idea, terrible security practice. ONLY require a password when it’s NECESSARY for the IMMEDIATE ACTION. Not hard. I have also experienced and continue to have this problem. It is not only frustrating but my biggest source of annoyance. I believed in the product and spent a lot to get it. Judging from the large number of published negative comments, one would expect some attempt to resolve this issue but with an estimated worth of almost ONE TRILLION DOLLARS, why the heck should Apple care about customers satisfaction. You (Apple) think all you have to do is to release your next product and watch your loyal customer line up around the block to get it. One would think Apple would learn something from former smart phone market leader Blackberry who ignored customer complaint and ended up below the floor-mat. There are frequent software update promoting user experience (basically to collect information on customers), games and yes, that constant pressure to buy more iCloud storage. I could go on but I’ll just get to the point. Take a good look at customer concerns and try to address them before the realize that you are not the only game in town. The above fix is only a temporary work-around. I do the suggested steps several times a day and the problem keeps reappearing. Any other suggestions? I reset my settings to factory and so far so good. Sign out COMPLETELY from the iCloud, on ALL DEVICES you own, including iTunes. Shut down all devices. Restart all devices. Sign back into the iCloud on all devices. Shut off all Apple devices. Restart them all. Reset to factory defaults. Sell all Apple devices on Craigslist and buy Android stuff. Not everyone is rich like our Little Johnny here to waste money and time on cheap and flaky Android stuff full of malware apps. … yeah because our iPhones are working wonderfully, dumbdum. This is only a “solution” if you want to be logged in to the iCloud. If you want to use iCloud features, you have to login to an iCloud account. It is that simple. The Apple ID is an iCloud ID, thus all Apple ID features are also dependent on iCloud, and vice versa. If you are getting the Apple ID verification messages, it is because the device is trying to use iCloud service but can’t, so logging in to the Apple ID will make them go away. This is the same for iPhone, iPad, iPod, Mac, Apple TV, etc. To avoid the Apple ID the only other option would be try to turn off every single iCloud service (iMessage, iCloud, FaceTime, etc) and avoid every Apple ID service (iTunes, App Store, iBooks, Apple Pay, etc), but at that point you are missing half of your iPhone features. Don’t. Signing out iCloud will REMOVE all the data stored on your Cloud. Never do that. If you don’t care about the data, then you can edit. Even a RESET would be a better option than this. My cousins, uncles, friends mom made $20,000,000 last month proof reading email for Tim Cook. I’m very surprised your relatives can read. And I am surprised he can afford to have Internet access. Only jobless and poor buy Android stuff. and you beleive everything your friends uncle’s cousin’s dog’s sister’s parakeet says?? and how do the other inbreds in your family feel about this ? And this is why I will not return here! Mean, rude uninformed people with way too much WRONG information jumping to mislead, ugh! I have many of apple’s devices, Mac’s multiple iphones, iPads, list goes on and on, and everyday I’m getting more and more disappointed in the quality and lack of attention to detail Apple once had while Steve Jobs was alive. I’m starting to see too many dropped balls in too many areas. I guess if he’s not around kicking everyone’s a$$ at Apple everything goes to hell. I see this as Apples 10 count of slow erosion. They were nothing without him before, and they will be nothing without him now. Cash in your chips now. Apples hay day is over. Dealing with this garbage right now. Turns off iMessage etc if you don’t constantly enter password. Apple you make crap software get with it. What the hell is the point of TOUCH ID if you can’t even use it for an Apple service? Typing an AppleID password endlessly is enough to drive one to madness. But Apple has already moved on, Macs and iPhones aren’t the next big thing. Watches, cars, and other things are the bright and shiny things. Given how buggy iOS and OS X are, can you imagine how buggy carOS will be? Good lord. Driving down the street and suddenly “please verify your Apple ID to press the gas pedal” and you get back into the car after getting some groceries, “please enter Apple ID to start car”. Endless! Should be fun times all around. Apple Car: buggy, crashes constantly, after installing latest software updates the car suddenly slows down to an annoying degree and can’t go faster than 40mph on freeway and 15mph on regular streets with CarOS to push you to spend another fortune on a new Apple Car, battery life lasts 12 minutes with use. Can’t wait! Going to so be great, cost will be $50,000 for the junk model and $200,000 for the aspiring d-bag model! thanks for posting the steps towards a solution to this annoying problem. We are trained by the SW companies to accept this crap. Just imagine you are driving happily with your car on the highway and then it asks you to get out, and unlock the door to continue driving. If we allow the same SW companies to install SW in our cars, we will end up with the same crap. And cars is just one example. Using iCloud will auto fill in your passwords and usernames for any account you need. But you have to use iCloud for it to work. But there are many that just love griping rather than learning how to use a device, who are better off simply watching the Tube: click on click off. You do realize that is the BEST way for hackers to get it over on you. Your giving up safety for convenience. Now that is as stupid as giving up freedom for security. You don’t deserve either. You never autosave to autofill all passwords on a browser or anywhere. You know while we are at it why don’t we just have the cloud autosave and fill in our social security number and birthday. You are so clever, keep to the tube. I get a different message that does involve going to ‘Setting.’ It keeps popping up a window that asks me to enter my password right there in the popup window. There is field for entering it and everything. It allows me skip it by selecting a delay: I can’t quite recall, but I think it’s either “Later” or “Not now”. How do I get rid of this one? Everytime I get this alert, and ignore it. I looks my iMessage and FaceTime accounts associated with the AppleID. This is F***ING ANNOYING APPLE. Get your S*** together. So stop ignoring it, and start fixing it. This is the fix. You can fix it, or you can complain about it. Your choice. I know what I do. Why, it’s my device, why should Apple impose their will upon me!?! Apple can only impose their will if YOU choose to use an Apple device. Don’t like it? Try an poor man’s Android or a very slick Windows device. The fix is to log in when you don’t want to be logged in? An alternative idea is to remove your Apple ID authorization from the Keychain. That worked for me. Now _that_ idea I like! I had this problem and Apple couldn’t offer a fix. After a month and a half, it just went away. iTunes always nagged me for a password too when I opened it but it doesn’t do that anymore either. I had this problem escalated to the SW engineers at Apple and they were at a loss on how to fix this problem. We tried the fix described here with no luck. One day everything just went back to working as it should….weird. Its weird, I never had this problem. Well I guess I experienced it once but after I entered the password for verification that pop-up never coming back. My suggestion you should try to completely Log Offf your Apple’s ID from your idevice and then try to Login again. It should solved the problem. So the answer is to give them what they want? I don’t want to log in, period. Any solution for me? Had my online ID stolen and on-going i-attacks. With this buggy software, difficult to figure out whether the hackers or Apple are my Nemesis. Playlists disappear, passwords revert to old ones or I’m locked out. Those pop ups, malware or Apple? Even makes me wonder whether the software is mimicking the DOS attacks and filling my logs with security alerts. Impossible, I think? So what do tell your insurer, law enforcement, etc.? Apple’s errors make me appear like I’m lying or nuts, so even knowing the hackers’ IDs I get nowhere. Sign In to ITunes pop up appears continuously. How can I kill it? Just to add to the collective understanding. I was trying to fix this on my wife’s ipad. One thing I noticed is that she had her itunes setting set to iCloud backup but didn’t have her iCloud set up from her iTunes as of yet. Then I backed up the iPad without cloud backup. Also more likely the ipad hadn’t used two step verification. As soon as I set that up suddenly the ipad had a new update to download. Coincidence? Quelqu’un a créé un compte AppleID en utilisant mon adresse email avec son iPhone5: il a saisi des questions de sécurité et son numéro de téléphone en Italie mais a rentré une adresse mail invalide qui ne lui appartient pas (et ne lui a jamais appartenu: j’ai cette adresse mail depuis près de 20 ans). Apple refuse de supprimer mon adresse mail de ce compte AppleID étranger qui est bloqué par des questions de sécurité que je ne peux répondre, et un numéro de téléphone mobile en ITalie qui n’est pas le mien. Le support Apple REFUSE de supprimer mon adresse email et mes infos personnelles de ce compte cré par un tiers. C’est un bogue sérieux dans la création de compte AppleID depuis l’iPhone 5: un utilisateur peut créer un compte AppleID en mettant n’importe quelle adresse email qui ne lui appartient pas et NON VERIFIEE (Apple envoie un code de validation uniquement au numéro de téléphone indiqué sur l’iPhone 5, il oublie de vérifier l’adresse email indiquée)! Le problème: cet utilisateur fait des achats sur l’Appstore d’Apple, et je reçois des factures d’impayés ! Et maintenant il insiste auprès de Google pour récupérer mon adresse Gmail ! Je n’ai jamais créé ce compte AppleID (je n’ai ni iPhone, ni iPad, ni compte iCloud) ! Mais mon adresse Gmail est à moi et je veux la garder. J’ai accès au compte AppleID, mais je ne peux pas changer la date de naissance ni répondre aux questions de sécurité, ni changer le numéro de téléphone (que je n’avais pas renseigné sur AppleID.com car je n’ai pas d’iPhone). Apple m’envoie en revanche ses spams publicitaires en Italien ! C’est un bogue de l’iPhone5 et des services Apple de création de compte qui ne vérifient PAS l’adresse mail saisie sur l’iPhone5 (le code de validation n’est PAS envoyé à l’adresse mail indiquée, juste au numéro de téléphone par SMS de l’iPhone5) ! Apple kept asking for my password, I kept hitting “Not Now,” so they took control of my iPhone. I could use it only to make a 911 call! I paid for the phone and I pay Verizon for service, but Apple owns it. Unbelievable. Then, of course, even though I know I entered the right password, Apple rejected it. This has happened again and again and again. Several times I changed my password to move on, copied and pasted the new password into the login box, only to have Apple tell me it wasn’t the right one. But what can I expect? Once they told me my birthdate wasn’t my birthdate. They own everything. Even my origins. Worse than the government. At least the FBI makes an attempt to hide their surveillance. Not Apple. Fascist company. I hate them. I’m sick of having to figure out how to get around their intrusions into my equipment. Telling me a password is more secure than my fingerprint? What Apple moron made that decision? You are right. All Apple wants is for their users to buy icloud space. They make an extortionate amount of money from it. They have all your data on their own servers which THEY own and they can do whatever they want with it. If you have a spouse who dies and you don’t know their access code if you ask Apple for it, they won’t release it. Their phones are more expensive than any other and you have to pay more and more for icloud. I had an iphone 4 once and never liked it. Never again will I buy an Apple product. What if I don’t WANT to use iCloud? I never do, but this constant request that I log in with my Apple ID only started recently. How can I get rid of the messages anyway? Yea, and the last times I heard that story it was a stolen phone sold on Craigslist by a third party CLAIMING to be the owner. I had a dumb-ss actually call me to ask him to unlock the phone because he just bought it from someone (the person who STOLE IT from me). Wow you’s are talking as if you knew Steve jobs personally. My problem is that I have an older iPhone, the 4s, so not super old but the last time I updated to the new ios my phone would barely run it. My phone is now super slow and extra buggy like crashing often. I get these most annoying pop ups asking for my password over and again, one time 6 times in a row, but if updating is the answer for me I am afraid it will make my phone work even worse than it does now. I can’t afford a new one so do I just deal with it? I have to back up and deal with my inlaws iphones and ipads and I find it excruciating. I log into their itunes account on my pc with just the apple id and password but if I want to go to icloud or anything else from there I have to re-enter the apple id/password with a code to follow if I click on something else. It makes no sense. I am logged in to my apple account, I shoudl be logged into all Apple services. Makes too And don’t get me started on trying to back a full ipad or ipod onto my pc. It won’t work! You have to delete things off the iphone/ipad/ipod in order to back it up. Not the same applies if you purchase icloud storage which I wouldn’t do if my life depended on it. Everything Apple does is designed to make you buy more space. When you use an android phone, you can have an additional memory card so you don’t run out of space. That’s the way it should be. And ipads should have a usb port for a memory stick – oh but that would mean you could remove things and save them without buying icloud storage. Fools and their money are soon parted. What a POS … loaded Ipad with movies and got a plane … boom ..popup every 10 sec… no Internet … can use my Ipad as brick now. Never again … apple junk . still suffering this bug and tried absolutely everything! Right now a Nokia 3310 seems like the only solution! Access your Apple ID login via browser and remove the affected device. Then sign in and add it again on the device that’s having the issues, that fixed it for me. As friendly as Apple techs are they know jack for troubleshooting. It’s a F—–g phone! it survived the first contact with the wall. WTF is up with entering my passcode every, THAT”S EVERY, time I want to use the phone. The fingerprint doesn’t count, evidently! I wonder how it will fare when I take it to my carrier or better yet the Apple store and throw it through the window. I’ll be sure to show them the single digit universal passcode when I leave! Yes Xcaliber your iPhone locks itself when not in use, with a passcode, for security purposes. You can disable the passcode if you want, but that means anyone can use your iPhone and access your email, contacts, pictures, everything else, without a password. That has nothing to do with the Apple ID verification requests, which is separate. The worse virus I have caught in 2018, the Apple ID verification virus! Most annoying and time consuming virus I’ve ever had. It spread to all my i-Devices, and is sheer agony to deal with. I used to love Apple, but this virus is definitely getting my closer to the loath side. I wish I had a mult-billion dollar company, so I could _not_ solve such huge client facing problem. Awful. I’ve been trying to stop the verification pop-up for awhile. I think part of the problem is that my iphone account still recognizes an old, discarded email account that apple couldn’t delete. So it asks for a password that I and no one else can provide. BTW this an old iphone4 that I use as a security camera. I have to cancel the verification request every few days or soor the camera stops working.